The final word count for the draft was 69,527. I immediately printed the whole thing off and the next day sat down to start editing. I always do my first editing pass on paper using an actual pen. At this point I want to focus on big picture issues – continuity and plot holes mostly. If I edit on the computer, I tend to get distracted by the details and end up tweaking sentences instead of looking for the major problems. I do still mark clunky writing, unnecessary repetition that isn’t necessary, and things like that but I don’t get caught up trying to fix those issues. That comes later. 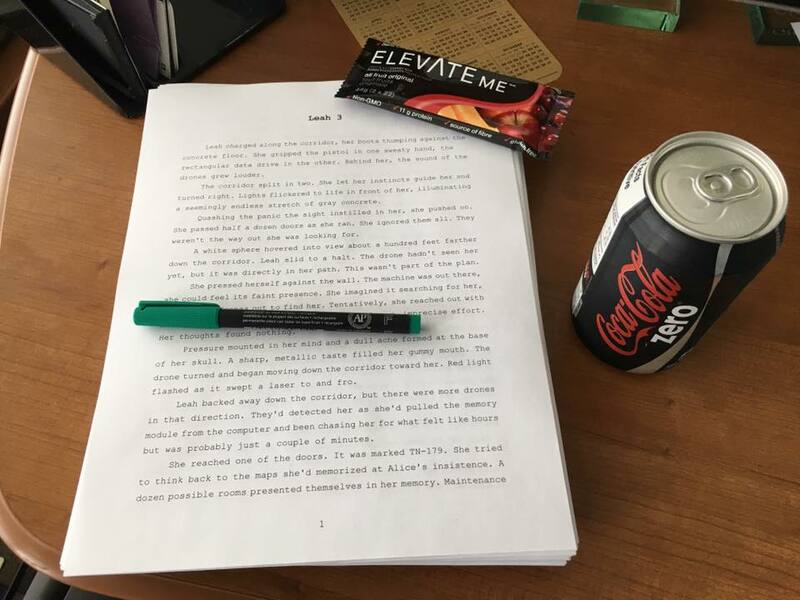 I try to read through the whole book in one day so that I can keep track of the story properly and by the end of the day I’d done just that and had 226 pages covered with green ink (thanks Coke Zero). Since then I’ve been working through those notes, hacking out chapters, inserting foreshadowing, fixing the clunky writing I spotted. That took longer than the read through but it’s done. Now I have a sort of Draft 1.5 that’s got all the good bits from the first draft and a handful of blank spaces where I want to rewrite the scenes that weren’t really working. Today I start filling in those blanks on the way to the second draft.